As part of the 2013 goals and resolutions, I’m working on cooking with ingredients we already have on hand in our pantry and freezer. This recipe incorporated many of the ingredients we had in the pantry to make a spicy, delicious three bean vegetarian chili. It was a little too spicy at first so I ended up adding one tablespoon of cocoa powder to tame it down a bit. When I make it again, I’d probably do the same! Lentils are becoming one of my favorite new beans! Isn’t this a colorful mixture before cooking? 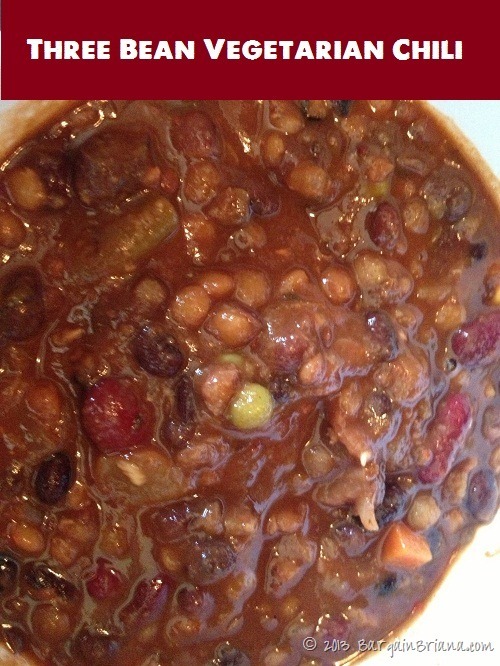 This was a delicious three bean veggie chili that is packed full of protein. 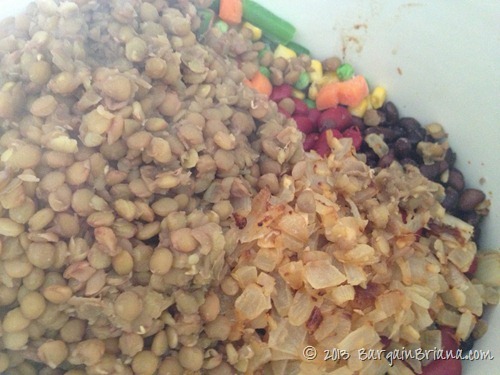 It makes a huge batch and I was able to freeze a few portions for meals at a later time! Heat oil, minced garlic, and onion on the stove in a pan over medium heat until onions are soft. Cook for 7-8 hours on low.